MUNICH — The first-movement cadenza exploded out of its context in Daniil Trifonov’s novel reading here Dec. 14 of Rachmaninoff’s Third Piano Concerto. This meant, among other compromises, a slight suppression of everything that preceded it, including the 130-measure development. Trifonov understated the folksy first subject and sped without emphasis through the unsettled transition to the second, whose cantabile theme he traced affectionately. Along the way, conductor Valery Gergiev held in check the Munich Philharmonic’s volume of sound, tidily echoing for instance the soloist’s restatement of that cantabile, while Trifonov supported his experiment with astonishing skill in the fast runs and big chords as well as phrasing of graceful expression. But refining down the dynamics, and careening through swaths of material as if the sound picture mattered more than argument, reduced much of the movement’s rhetoric to impotent frenzy. The remainder of the concerto went more conventionally, still with terrific playing. Trifonov burst into the Intermezzo with due drama and, together with Gergiev, expertly pointed the rhythms of the Finale. If anything hampered him, it was a deficit of tension resulting from the slighted statements in his opening movement. 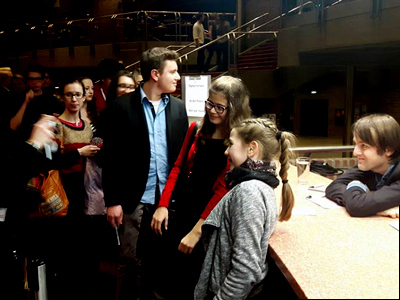 In a brief onstage interview afterwards at this Jugendkonzert in the Gasteig, the somewhat nerdy pianist deflected awkward questions from emcee Andreas Korn — “Can we see your hands? Are they big?” — with smart observations about what Rachmaninoff could achieve as a player, before running dreamily through Alla reminiscenza from Medtner’s Opus 38. For Scriabin’s glittery, glowing Poème de l’extase after the break, the MPhil mustered welcome refinement, not least in its brass. The concert opened with the Act I Prelude from Lohengrin, nicely propelled but without ideal sheen in the strings. This entry was posted on Wednesday, December 30th, 2015 at 3:53 pm	and is filed under Munich Times. You can follow any responses to this entry through the RSS 2.0 feed. Both comments and pings are currently closed.